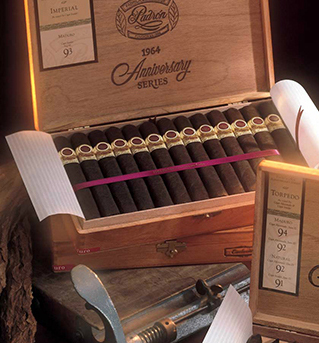 Padrón 1964 Anniversary Series cigars were introduced in 1994 to commemorate the companys 30th anniversary. The 1964 Anniversary Series cigars are available in both natural and maduro wrappers and the select Nicaraguan tobaccos from Jalapa, Condega, and Estelí used in this exquisite line are grown in open sunlight and aged for four years. These medium- to full-bodied cigars are decadent, rich, and elegant with cocoa and coffee notes at the fore mingled with sweetness, earth, cedar, nuts, and pepper. Impeccably handmade and sharply box-pressed in a distinctive style, Padrón 1964 Anniversary Series cigars are consistently ranked by industry experts and cigar connoisseurs alike as one of the top brands in the world. For the protection of its customers, Padrón introduced measures to safeguard against counterfeiting with a specially designed band featuring an individually numbered guarantee label.